We all do our best to look after our car by bringing it in for a regular service, but how much care do we take over its exterior? Keeping your car looking good on the outside isn’t just about looking good! It will save you money on repairs if you take regular care and also help with the re-sale price when the time comes to say goodbye. First let’s look at the paint. There are basically two primary types of car paint – water-based and solvent-based paints. Both use a liquid that holds the pigment in suspension so it can be sprayed, and once dry the two types of paints compare favourably. But whichever paint your car has, you’ll need to make some effort to look after it. Even if you keep your car inside a garage overnight, it’s still out there in the elements most days. The sun’s UV rays will have some effect on paint, and worse still can also affect the inside of your car by fading upholstery and the dashboard. We recommend putting a reflective screen inside your windscreen. 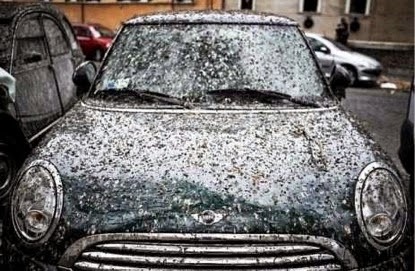 But added to that the gravel and stones that flick up off the road, sap from trees that you might park under and at the very worst bird droppings, will all leave marks on the paint if not cleaned away. The birds took a liking to this Mini Cooper! Some people like to wash their car every Sunday. Others say that a once a month hose down with some car shampoo is ideal and others swear by a wash and wax every 6 months. Whichever your choice may be will probably depend on how dirty your car gets, but we’d recommend that you pay it some attention and make sure that dirt and debris don’t stay on its surface too long. Waxing the paintwork after a wash will help you protect the car for longer, and the nicer your car looks the more likely you are to look after it. An extra coat of wax on the bonnet to cope with the added heat there is recommended. It’s also a good idea to touch up paintwork as soon as you see any nicks in it, so that the rust doesn’t set in. Or if it’s a larger dent have it seen to sooner rather than later. This dent should have been attended to a long time ago. Look at the rust! So love your car. If you leave us to look after the mechanical parts and you look its exterior you’ll be rewarded with a vehicle that’s a pleasure to drive and you won’t mind being seen in! A BIG THANK YOU to everyone who took part in our survey recently. We're now going through the results to ensure that we maintain our high standards and do what we can to improve. The lucky winner of our $50 voucher towards a next service was Patricia Brown. Well done!